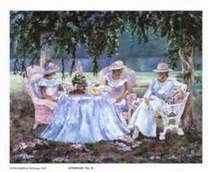 God's Grace Overflows: Let Us Have Tea! There is just something special about a tea party, isn't there? Decorate the tables, set the atmosphere! Rejoice in the friendships of your girlfriends! Talk, Laugh, Pray, Read from the Bible, Dance! May you all be blessed at the weeks to come! Lets have tea today and dance! I want to thank you so much for your sweet and encouraging comments on my blog. Also, thanks for the compliments you gave me on my aprons. I always have you on my mind when I am looking at the material. I love your new photos on your sidebar. It would be a joy and honor to have tea with you, dear Amy :) Thank you for this delightful post. May you have a beautiful week. Hi Dear! Time for some 'girl time' right? What is more precious than our girlfriends? Yes my dear, you have figured me out. I love to walk. But, I also love coffee, desserts and bread, so I'd better walk or I won't fit through the door! Thank you for being such a good friend to me. I'd have tea with you anytime. I'll bring the dessert! Do you know that I've never done this? I actually have lots of tea cups, and a few pots, but I've never actually had a tea party. Hmmm... it might be just the thing sometime this month. Just a small affair with two or three friends for my first time. I love this poem so much!!! Amy, you just got me so happy!!! Your post should be published on the Tea Time Magazine I really think! 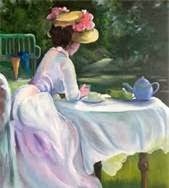 Wish so bad we could have a tea party just like you described! It will be certainly one of the best tea parties ever!! LOVE you dear friend and excited to read your post below! It looks WONDERFUL!! I think maybe we better plan it for Christmas time, what do you think? Oh YES! This is how I have been feeling all week! I think we must have been feeling this way at the same time!